So I am finally here! It is currently Sunday eve and I arrived on Friday morning. I wanted to wait a couple of days before I posted, as to be honest my first few days have been hard, and I wanted this blog to be positive, smiley, warm and fuzzy! However, I also want to be honest about my experiences. On Friday, Sydney greeted me with grey skies and rain. I arrived at my accomodation [which wasn’t what I truly expected from what I had seen online]. I tried to stay awake for the whole day during Friday, to acclimatise to the time zone, but was basically shattered. I then thought food would make me feel better so went out searching. I got majorly lost on the trains, completely wet and cold as it was pouring with rain at this point and then realised why every shop was closed as it was Good Friday. I returned home hungry, tired, sad and looked like a drowned cat. So Friday was a bad day as I just felt like a tiny fish lost in this big city and all I wanted was my home! Saturday was pretty much the same as Friday. The weather looked like this …. no more to be said. 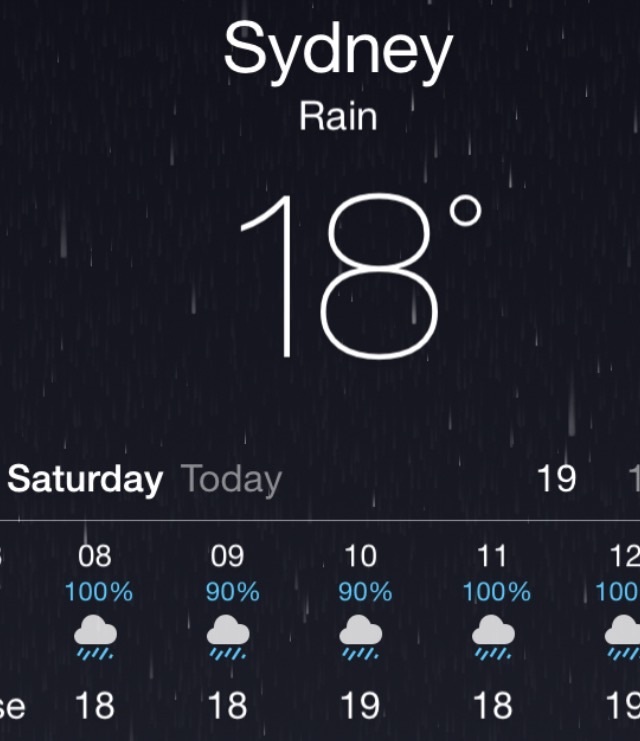 I have learnt that when it rains in Sydney- it ***** RAINS- there’s none of this drizzling/light showers like in the UK. Today [Sunday] I woke up to blue skies and the sun shining. It makes such a difference to my mood when the weather is nice. I immediately wanted to go exploring and put my running stuff on. I ran down to the bay- soon realised the epic hills in Sydney- and was greeted with this beautiful view. I then decided to follow the bays around, heading towards the centre of Sydney. This was quite difficult to run as I was following bush trails so very rocky and constantly up&down. Ps Sorry if some of my photos are fuzzy- my wifi is quite poor so cant upload high quality photos.